Ambassador Captains: Andrew Shipp, Bobby Bridwell, Claire Robbins, Darla O'Neill, Dustin Beavers, Grace Handler, Mary Mocniak, Paul Smith III, Ray Mitchum, Rebekah Drummond, Ron Johnson, Susan Swearingen, Tanya Windham Dora, and Ted Smith. The Ambassadors are the public relations arm of the Chamber, providing ribbon cutting, grand opening and groundbreaking services and support. Ambassadors benefit by being on the inside track of new developments, meeting new business owners and helping the Chamber support its members. If your job includes being active in the community and making frequent contact with prospective customers, you should be an ambassador. 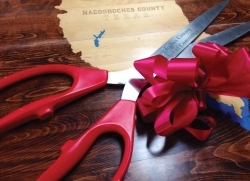 Click for the Ribbon Cutting event outline. One of the most highly anticipated events of 2017 was the grand reopening of The Fredonia Hotel & Convention Center by Citizens of the Year Richard and Barbara DeWitt and their fabulous hospitality team!